This is the first game in the Bionic Commando series. For other games in the series see the Bionic Commando category. For the NES sequel to this game, see Bionic Commando (NES). 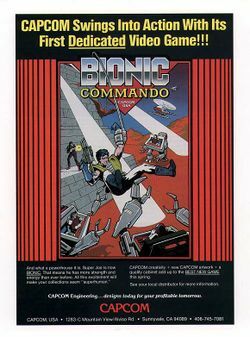 For the Game Boy remake of the NES game, see Bionic Commando (Game Boy). For the 2009 sequel, see Bionic Commando (2009). Bionic Commando, released in Japan as Top Secret (トップシークレット,, Toppu Shīkuretto? ), is a 1987 action platform game released by Capcom for the arcade. It was later released for several home computers (ported by Software Creations and published by Go!). An emulation of the arcade version is included in Capcom Classics Collection for PlayStation 2 and Xbox; and Capcom Classics Collection Remixed for PSP. Capcom later produced a sequel for the NES, titled Hitler's Resurrection: Top Secret, but localized with the same title Bionic Commando. The identical title created confusion, and the sequel is often considered a port, but it is drastically different from the original arcade game. The game was advertised in the United States as a sequel to Commando, going as far to refer to the game's main character as Super Joe (the protagonist of Commando) in the promotional brochure, who was originally an unnamed member of a "special commando unit" in the Japanese and World versions. The protagonist of the game is a commando equipped with a bionic arm featuring a grappling gun, allowing him to pull himself forward or swing from the ceiling. The series is notable for being one of few instances of a platform game in which the player cannot jump. To cross gaps or climb ledges, the hero must use his bionic arm. The levels of the game are straightforward and semi-linear, containing many enemies and other dangers lurking about. Unlike most platformers, the player must navigate the level via the use of a mechanical arm that can pull him up ledges since he cannot jump. The arm may also be used to collect item. Prizes like points and power-ups can only be obtained from crates that come on the screen in a parachute, which can be revealed by shooting them. Unlike most of the later games, the player cannot use the arm and shoot at the same time, the arm cannot be used in the air and the only power-ups are weapon enhancements. This page was last edited on 20 February 2018, at 18:20. This page has been accessed 22,977 times.